This LP has 126 parts. Im sorry, what is this? 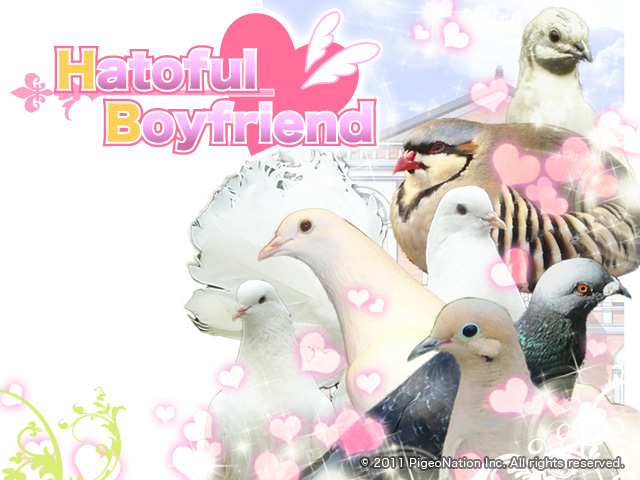 Hatoful Boyfriend is a name youve probably stumbled across while on the internet. 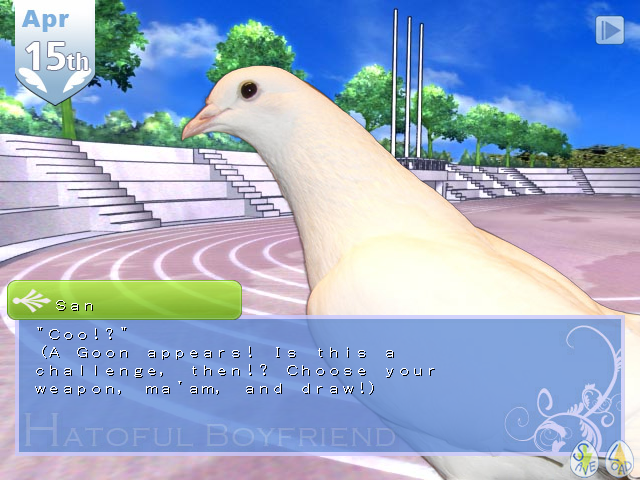 Its more commonly referred to as that dating game with the pigeons, and this is a fairly accurate description. Hatoful Boyfriend was released for the PC in 2011 by Hato Moa, and is an otome (female-targeted) dating simulation game that features pigeons as the dateable characters instead of humans. Originally created as an April Fools joke and a parody of typical otome games, the game is well-written and shows a lot of care and effort on the part of Hato Moa, who did all of the art and writing. Wasnt there another LP of this being done on the forum? Why yes there was! Epee Em started on this game a while ago, but has dropped the LP in order to return to his true passion of playing and laughing at Mega Man Battle Network. I believe the thread has fallen into the archives at this point. He also tended to cut out a lot of the text in order to make room for commentary, while the plan here is to have the full script transcribed, with a few additions here and there. So hows this LP going to work? This is going to be a screenshot LP. Im also going to try and do this as a narrative LP to fill out some of the narrators character, though this game tends to do well in speaking for itself, so additions will probably be sparse. And youll be given the chance to help our fair narrator out by giving her advice as the various choice points pop up in the game. Since there are eight possible birds and therefore eight different routes, well have a lot to vote on. I may take over if the narrator is being led to a path we've already gone, but for the most part it'll be all up to you. EDIT: This policy will only be in effect for the first playthrough. Following paths will begin with a vote for which bird to pursue, and I will take over the playthrough from there. All additions to the dialogue will be in italics. All notes added (musical cues, additional information, etc.) will be in bold. 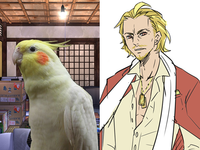 Also, since this game is a parody of more standard otome games, at the end of each path, I will include an analysis of our husbandove's character archetype, looking at some of the defining traits and overall reception of these character types in otome game, as well as examining specific examples from some of the more popular otome series. No spoilers. The madness is best experienced blind, and there really is a lot to show in this game, so that shouldnt be ruined for the first time readers. Episode 10: Azami to the Rescue! Episode 38: The Boss of This Dungeon is...!? Episode 95: Who Killed Lourde Goon? 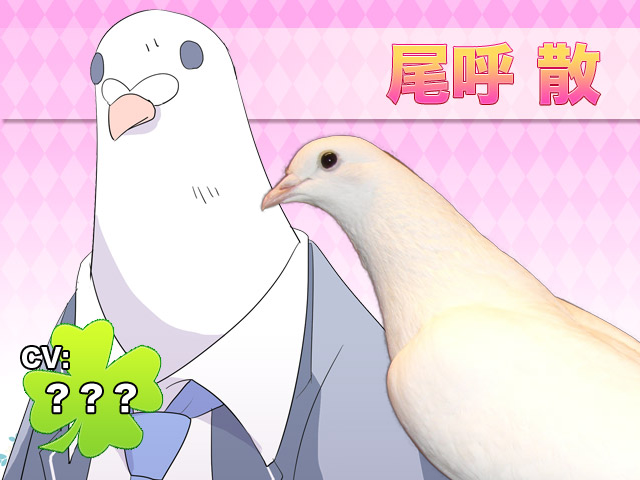 For April Fools Day, Hato Moa released a visual novel trailer for the upcoming Hatoful Boyfriend magical girl anime, Hatocatch Popocure: Dream Drop☆! It's only in Japanese, but thankfully nielsm decided to do an abridged translation so that we could all enjoy it. Episode 1: The Fairy's In A Pinch! Eh, I'm A Popocure!? The protagonist and narrator. 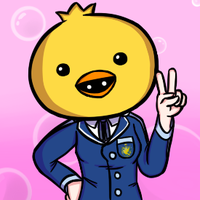 Plucky and cheerful, she is friendly to all of her schoolmates. The only human student at St. Pigeonations. Wears a yellow chick helmet in a futile effort to fit in with her peers. Her favorite food is udon. Her canonical name is Tosaka Hiyoko, where Hiyoko means chick in Japanese. 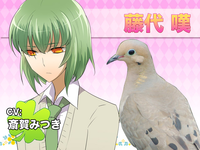 Goons childhood friend and a rock dove. He is kind and responsible, but also has an easily upset stomach and poor health. He works during the school year in order to take care of his mother, who is also rather sickly. 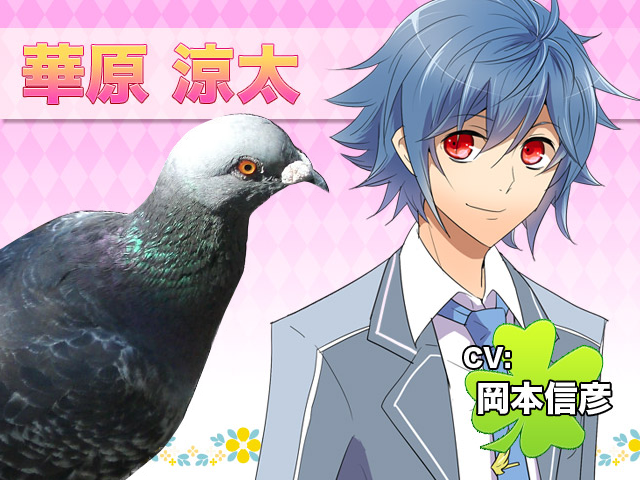 His name uses an alternate spelling of Kawara, which stands for the rock part of rock dove. 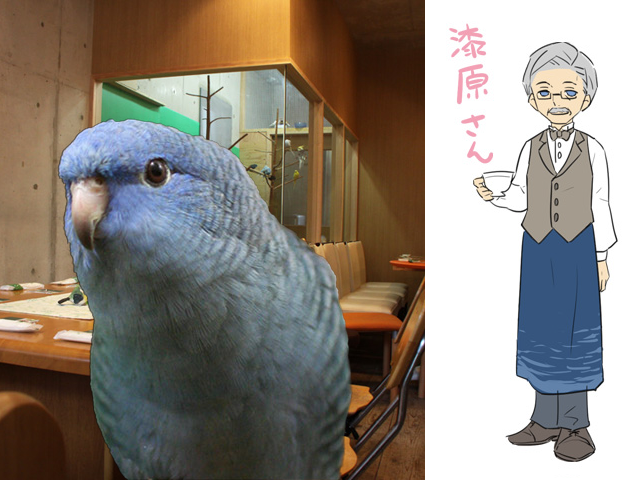 The homeroom teacher for room 2-3 and a button quail. Mild-mannered and kind, he teaches mathematics and is considered to be incredibly brilliant. However, he is a narcoleptic and is known to fall asleep during his own lectures. 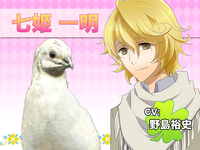 Kazuaki shares a kanji from the Japanese name for the button quail in his family name. 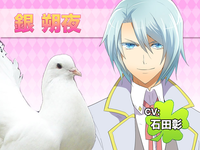 A French transfer student and a fantail pigeon. Comes from a noble family, shows it through his snobbish attitude towards his classmates. 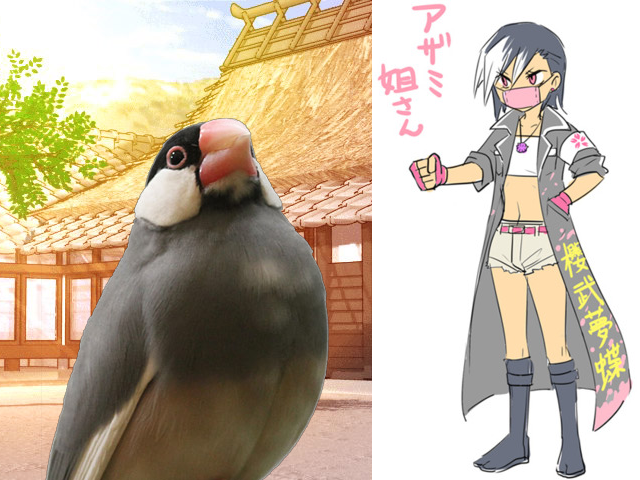 Apparently related to Sakazaki Yuuya. Freshman student and a mourning dove. Very quiet and stand-offish, he spends a lot of time in the library reading. The name Nageki comes from the mourning part of mourning dove. Upperclassman and a fantail pigeon. 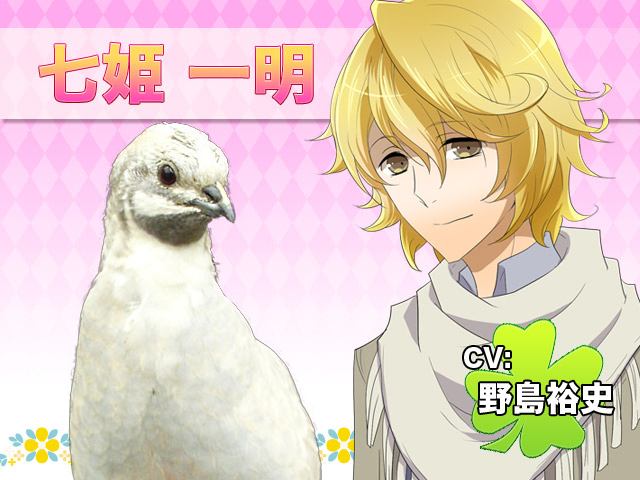 Very charismatic, imfamous at St. Pigeonations for his flirty attitude. 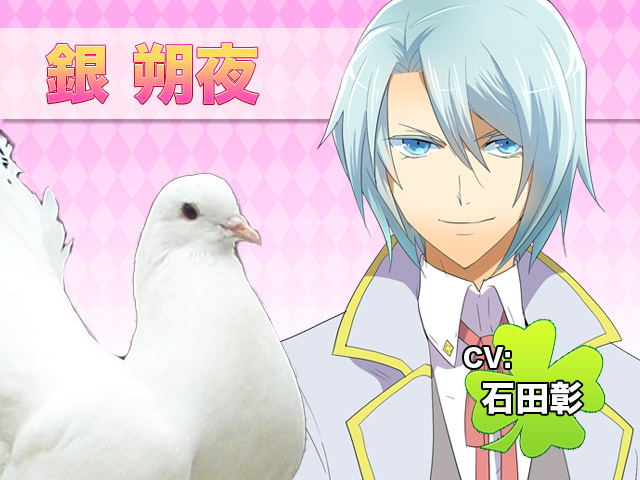 Apparently related to Shirogane Le Bel Sakuya. The school doctor and a chukar partridge. Notable for his work, but has an unsettling reputation among the student body. Very cold and known to sneak up on students. 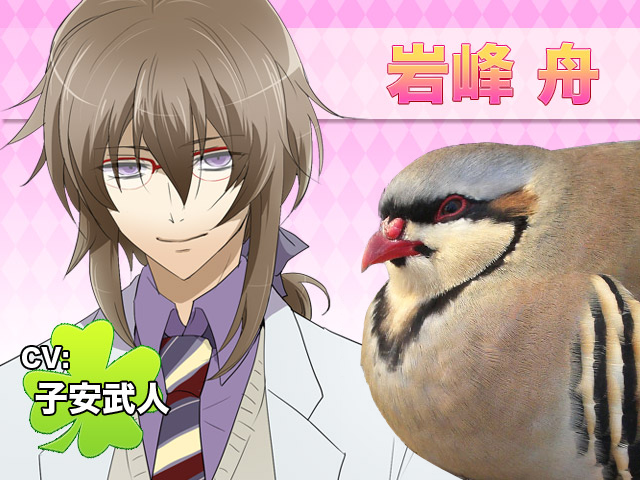 Shuu shares a kanji from the Japanese name for the chukar partridge in his family name. 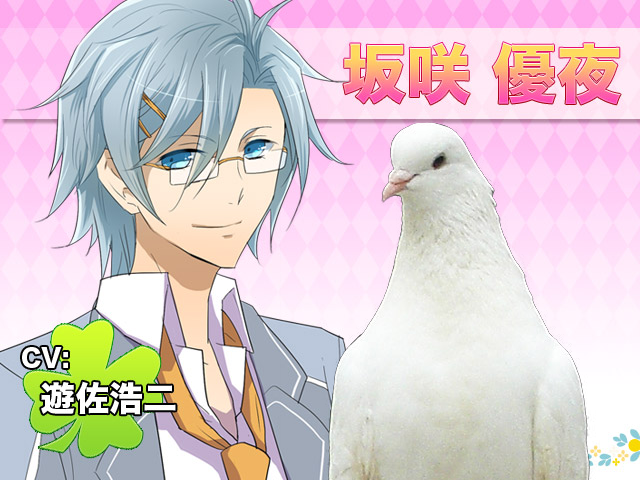 A sophomore student and a fantail pigeon. He is captain of the track team and rather hyperactive. He is a big fan of pudding to an almost obsessive level. He can only speak in coos. Oko Sans model is Hato Moas own fantail pigeon, also named Oko San. 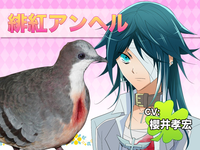 A sophomore student and a Luzon bleeding-heart dove. In the other second year class and seems very dramatic. Refers to other students by fantasy titles rather than their names. A Java sparrow. She rides a pink motor scooter, and is known to drive very carefully. She sells takoyaki and often shouts Carve it into your soul! Part of a biker gang called Hell's Birdies. On her gijinka design, she wears a long coat with her species name written in very complicated kanji. This is a common trend in members of Japanese biker gangs. An extremely elegant parakeet. Well-spoken and polite, he is the gentlemanly owner of the Torimi Café. 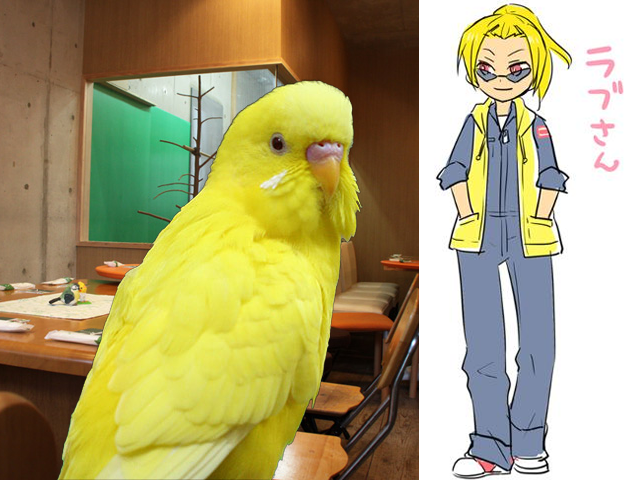 A yellow budgerigar with a Kansai accent. He is a regular customer at Torimi Café, and is friends with the owner, Kenzaborou. He seems out-of-place in the café environment due to his brash attitude and his unkempt appearance. A cockatiel and the janitor of St. Pigeonation's. Does not tend to talk to students and is considered a dandy, though he seems to be an acquaintance of Yuuya's.